Back Row left to right are, Mr Eales, Colin ?, John Rowe. 2nd Row, Alan Dale, Carl Bennett, Len Fisher, Keith Beastall. 3rd Row, Edith Holt, Janet Stringfellow, Margery Janney, Lucy Philpotts, Margaret Stirling. 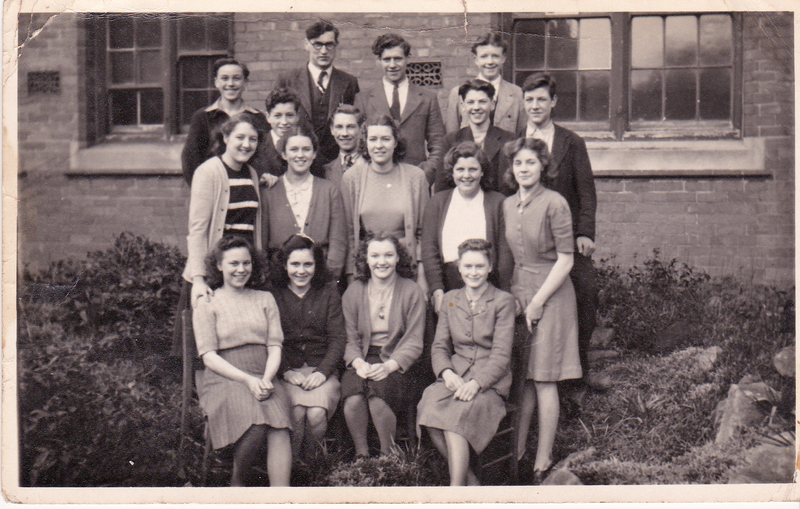 4th Row, Margaret Gregory, Margaret Mason, ?, ?, Rennie Cox aged 15. Thank you for info. Can’t believe they are still around, it is so long ago. Are you related to Ian and Steven by any chance? Ian was in my year at Forest View in the 60’s. Liz! I think you mean Margaret Janney who was a Student Teacher at Yorke St Seniors in 1948/49 Margery is her sister. They are both still alive and still in the area. I got into trouble with Margaret about writing an account of Princess Elisabeths visit to Mansfield stating we were anti Monarchists, we got the stick from Mrs Simpson, Form Teacher. Really interested in anything to do with Mansfield Woodhouse! Didn’t know that St.Edmunds also taught seniors. Was it called St. Edmunds in 1950 or was it still National at that time? Also, was the Mr. Eales the same person who taught me at Forest View in the early 60s? Did the young lady called Margery Janney go on to become a teacher at Robin Hood Infants on Cox’s Lane in mid 50’s. Think I remember a teacher with that name when I attended that school from 1956. All Rows should be Right to Left! Alan Dale loks like Alan Ticker Davis off Lawrence Avenue. In front of Alan is Edith Holt who passed away recently, extreme Left is Margaret Stirling from Shelley Avenue, during the war we used to swap Tea for Margerine.